With this Madre Tierra Mother’s Day Set we honor the womb from which we all came and will return to, the one true womb: Mother Nature. For some, this time of year can be challenging, especially for those whose mothers have transitioned on and for those who may never have experienced the feeling of a true bond with their mother. For others, this time of year is an occasion to honor the bond of love, nurturing, and wisdom that their mothers have provided. No matter what your relationship is to the woman who birthed you into this world, one thing is for certain: We all have the collective mother who nurtures us, nourishes us, loves us, and supports us. Her love has no limits and knows no boundaries. And this set was intentionally created to honor and send our love and gratitude to her, our beloved Madre Tierra. When working with these tools, allow yourself the space and emotional center to align with Mother Earth’s rhythm. With this set, will offer Madre a sacred smudge, burn beeswax with colors representative of all the layers of her being, raise vibrations with nothing but gratitude and boundless unity, as she has done for us since the day we were brought to Earth. Consider this your care package back to Earth, an act of love that reminds us cosmic beings of the profound opportunity to return to the essential unity with all that exists and within, the living, breathing energy of the universe. 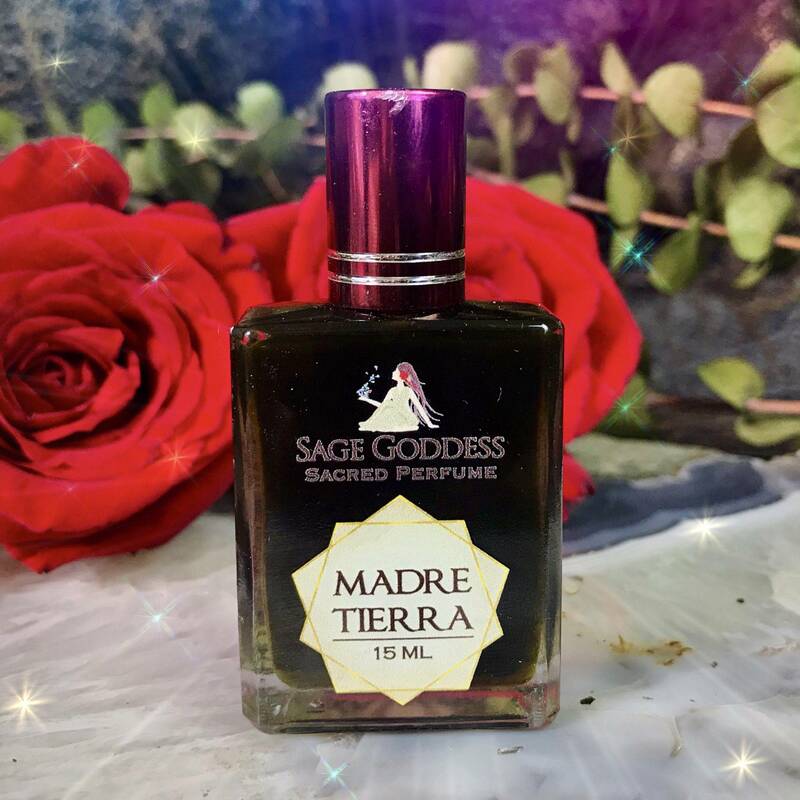 All of the items in this Madre Tierra Mother’s Day Set are unlike anything I’ve ever offered at Sage Goddess. You’ll receive a smudge bundle with herbs and dressings and intentions specific to honoring the universal mother; a beeswax candle with seven layers, each color representing an aspect and/or element of Madre Tierra; and lastly, my new Madre Tierra Perfume — a blend of essential oils and absolutes that’ll connect you even deeper to the heart of the one mother. You have the option of purchasing the entire Madre Tierra Mother’s Day Set or purchasing the individual items in the set. This year, let us honor and take time to intentionally express our gratitude to the one who gives of herself so selflessly — the one whose generosity is boundless, Madre Tierra. One (1) 15 ml bottle of Madre Tierra Perfume. My newest blend is a grounding, warm, and welcoming mix of vetiver, turmeric, patchouli, tobacco absolute, lavender absolute, and Gandhi root oil infused with a tiger’s eye chip stone for discernment and wisdom. Vetiver is grounding, provides balance, and is purifying. Turmeric’s spicy essence provides protection and healing. Patchouli is uplifting and inspires connection. Tobacco absolute connects you to Earth’s wisdom and the wisdom of the indigenous and ancient peoples. It’s protective and promotes peace, confidence, and personal strength. The aromatic essence of lavender is energetically protective, calming, and balancing. Gandhi root oil rounds out this blend adding calming and centering properties. I’ve never worked with this oil before; it brings a beautiful balance to this Madre Tierra Perfume that’ll anchor you back to Earth. One (1) Pachamama Beeswax Intention Candle (about 8”). 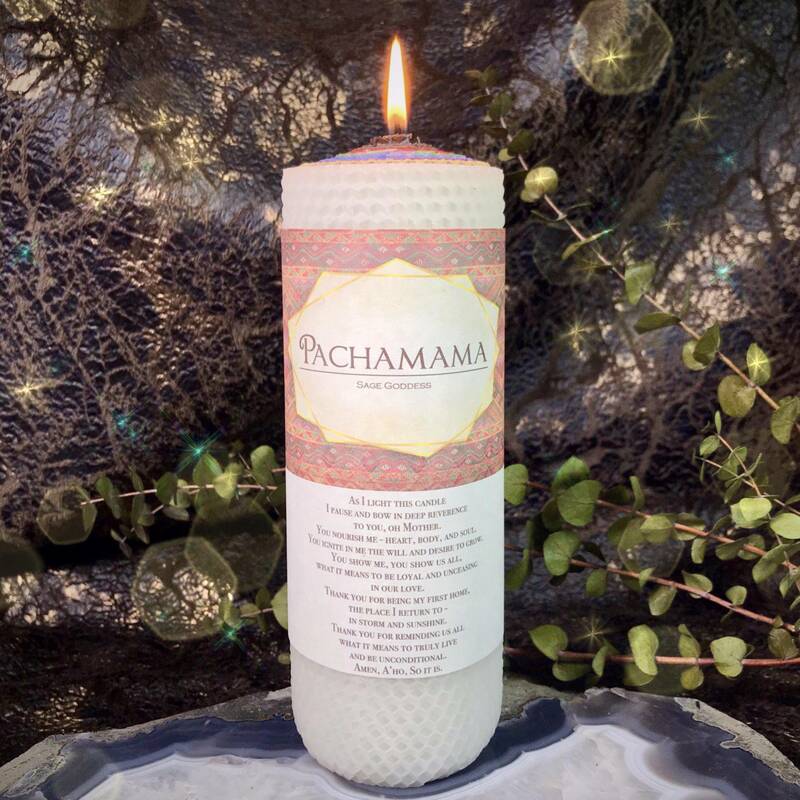 My Pachamama Beeswax Intention Candle is hand rolled with seven layers of beeswax and each color holds symbolic meaning. This candle is unlike ANY candle we’ve ever offered before. Starting from the core, black represents the unconscious and unknown and acknowledges the mystery and void that births us all. Red represents Earth or Pachamama and symbolizes our gratitude to her. Green resonates with the heart center and the present moment; it symbolizes abundance and our gratitude to the universe for our blessings. Blue acknowledges our gratitude to the sacred elements as well as the sky, clouds, and mountains. Purple serves as a bridge between worlds and represents the chakras and our gratitude to the rainbow. Gold is for vision and alignment and symbolizes our gratitude to the stars for their luminosity and all the ways they encourage us to shine. White represents the collective oneness and reminds us of our unity with all beings, across all layers and spectrums. Work with this candle to honor all of the elements and various aspects of Madre Tierra that all work together seamlessly in divine alignment. One (1) smudge bundle (about 4”). 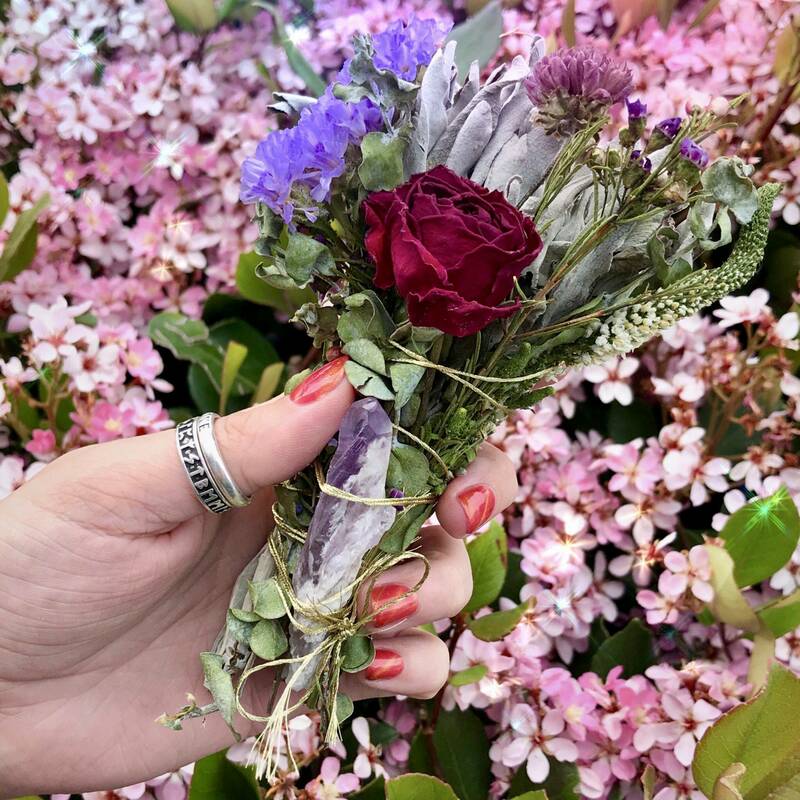 This smudge bundle is small yet power packed and handmade with sacred herbs and dressings, unlike any bundle we’ve ever made or offered before. Please know that all items in these bundles are 100% ethically sourced and made with only the highest vibrations. 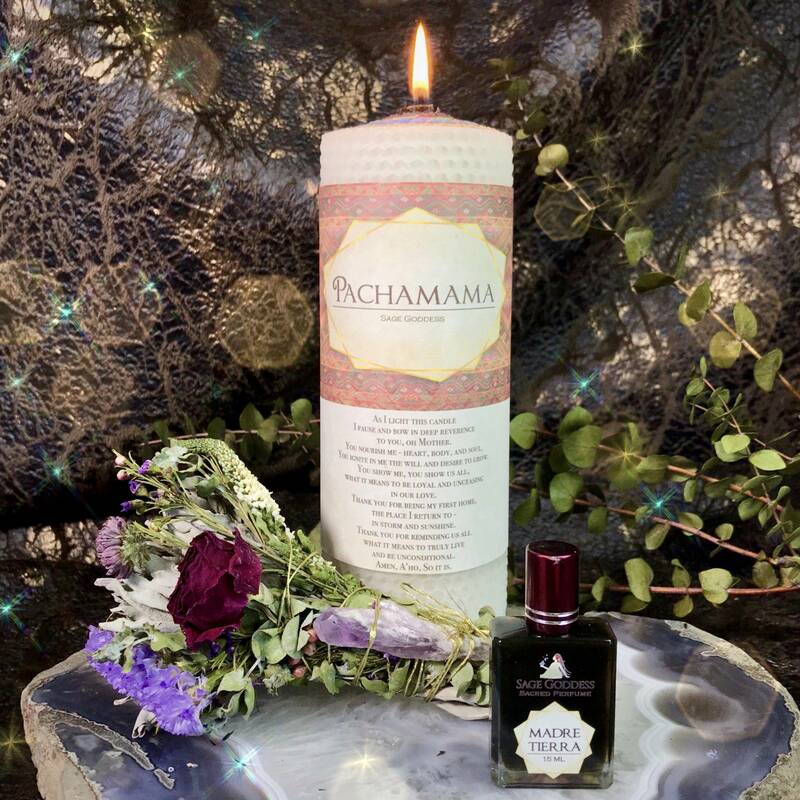 May this Madre Tierra Mother’s Day Set bring you joy and feelings of lightness as you anchor into and feel the love always permeating from Mother Nature’s embrace. And so it is. This listing is for one (1) Madre Tierra Mother’s Day Set, as described above. You have the option of purchasing the full set or each item separately. Please choose the option that calls to you from the drop-down menu. Yours will arrive lovingly parceled, ready for enjoyment. Note: Madre Tierra Perfume is made with natural essential and carrier oils and may contain fragrance oils. Cap color, chip stone, and color may vary slightly. For external use only. Please remove the label from the Pachamama Beeswax Intention Candle before burning candle, always use a heatproof dish on a stable surface, and never leave a burning candle unattended.